This week, the Washington Post's Peter Wallsten posted an article discussing the current immigration reform debate and exposing leftist groups from the Tanton Network who are "masquerading as conservative". Of course, if you have been following TexasGOPVote for any time at all, you have seen the evidence of this in many prior posts. Groups like FAIR, NumbersUSA, the Center for Immigration Studies and ALIPAC are groups backed by pro-choice, radical environmentalists who believe in zero immigration and zero population growth. Hardly conservative values. In 2010, Norman Adams and I addressed the Republican Party of Texas Platform committee. During that session, Adams introduced his article titled, "Spies in the Camp". In this article, Adams exposed the link between these Tanton groups and their leftist agenda. During the Platform committee hearings, Adams and I were joined by a couple of courageous elected officials who were willing to come out at great risk to their political future and stand beside Adams's claim. Those elected officials were Texas Land Commissioner Jerry Patterson and Harris County Judge Ed Emmett. Now, they are being joined by more and more elected officials and others who are getting on board the idea that our immigration system is broken and needs to be fixed. The Washington Post reports, "Conservatives who are taking on the groups, including ([FL Senator Marco] Rubio, anti-tax activist Grover Norquist and officials of the Catholic Church, argue that the three organizations [The Tanton Network groups] are motivated by far different philosophies than many of their Republican allies realize. Among those views: that population growth from increased migration threatens the environment." Predictably the Tanton related groups responded in typical libspeak with phrases like (paraphrasing) "our message appeals to conservatives and liberals" or "we have no official position on abortion" or "well we used to be radical environmentalists, but now we are just 'conservationists' ". Conservative organizations can clearly articulate their conservative positions. Liberal groups historically like to hide their progressive agenda in the weeds. The truth is, these groups support radical environmentalist positions and it doesn't take much googling to find it. Just look for Roy Beck's papers on population control as one example. Here is just one example from the NumbersUSA website. 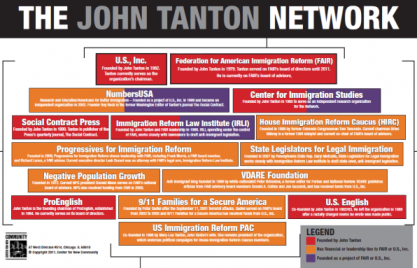 The Washington Post quotes a letter written by the Tanton Network founder John Tanton, a Michigan based leader in the "Zero Population Growth" movement, where he states his plans to, "move the battle lines on the immigration question in our favor” by convincing Republican lawmakers that “massive immigration imperils their political future.” The goal, he wrote, was to “change Republicans’ perception of immigration so that when they encounter the word ‘immigrant,’ their reaction is ‘Democrat.’ ” This memo was first exposed by Cafe Con Leche Republicans in a post last November. Republican groups have been gaining ground in rejecting the message from these leftist groups. Arizona State Senator Russell Pearce was recalled and removed from office after sponsoring a Tanton network backed AZ 1070 anti-immigrant law. Tom Tancredo, heavily backed by these groups, was defeated both in his Congressional re-election bid and his third party run for Colorado governor after his extreme immigration positions were revealed during his failed presidential campaign. And Gov. Mitt Romney's failed presidential bid was tainted by historically low Hispanic support after appointing Tanton backed, Kris Kobach as his immigration reform advisor. Republican leaders like Sen. Rubio understand that these Tanton network groups do not reflect the view of mainstream Republicans and even mainstream America. They are joining our chorus in speaking out against these groups who have worked for years to distort information on immigration to keep our broken immigration system from being resolved and driving a wedge between conservative Hispanic voters and the Republican Party's candidates. Recently, Latino's Ready to Vote founder Linda Vega wrote an article about CIS spokesman Prof. Stephen Steinlight's assertions that "Mexicans are inferior". This article referenced a speech I video-taped where he was speaking to a Republican Women's Group in Sugarland Texas. As you will see in the video above, his words to not reflect Republican values or principles but are, rather, based in hatred, fear and prejudice. Norman Adams recently posted an article detailing more information about these groups and why Republican groups should reject their message and their messengers. 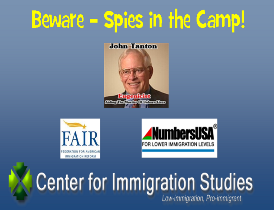 The "Spies in the Camp" article references a summary written by Anthony Vargas, "Hijacking Immigration? How the Immigration Debate was Taken Over by Pro-Choice, Environmentalist, Population Control Advocates" and a Pro-Life article by Mario Lopez in "The Human Life Review " written by The Human Life Foundation. The Washington Post article also reported on Mario Lopez actions with Sen. Rubio stating, "Rubio’s aides last week brought one of the organizers of the effort to undermine the groups, Mario H. Lopez, a party strategist on Hispanic politics, to a regular meeting of GOP Senate staffers, at which Lopez distributed literature about the groups’ backgrounds and connections. Rubio also raised concerns about the groups’ leanings during a recent conference call on immigration with conservative activists." 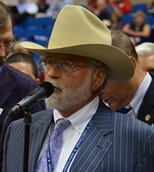 After the concepts were introduced at the 2010 Republican Party of Texas Convention, Adams worked with Von Army Mayor Art Martinez de Vara, Brad Bailey, Artemo Muniz, Norman Spears and a host of other Texas conservatives to develop what has become known as "The Texas Solution" platform plank in the 2012 Texas Republican Platform. More and more Republicans are coming on board with the idea that it is time to fix our broken immigration system. Recently, the Texas Federation of Republican Women (TFRW) passed a resolution providing support for Republican elected officials to take action on moving the immigration debate forward on real, conservative values. Republican Women's Clubs across Texas and the U.S. should look at this and reject the Tanton network of speakers who wish to use their groups to push agendas that are counter to the values of Republican Women's Clubs. Oddly the renowned pro-life group, Eagle Forum, headed by Phyllis Schlafly, seen in this picture conferring with Kris Kobach and environmentalist/pro-abortion/zero-population advocate Roy Beck at the 2012 RNC Convention platform committee meeting, have been sucked in by these organizations that support the very antithesis of her own group's battle against abortion. Roy Beck was personally mentored and his group was financially backed by John Tanton who was the founder and past president of Michigan Planned Parenthood. They say politics makes strange bedfellows, but really Phyllis? Republican groups should also be weary of locally affiliated organizations to the Tanton Network. Groups like TFIRE (Texans for Immigration Reduction and Enforcement) who used to be called Texans for Immigration Reform. At least they are honest about their intention to reduce immigration. Other groups like IRCOT and Women on the Wall are also closely tied to the Tanton Network and frequently quote their environmentally biased data. It is time for elected officials and Republican Party officials to join the chorus in rejecting these groups and their messages of fear and hate. They do not reflect the values we are trying to govern by. And these groups do great harm to Republican candidates and other conservative issues and to the recruitment of conservative minority voters.